“We applaud the Trump administration for submitting to Congress for review a 123 Agreement with Mexico, which facilitates trade in nuclear technology between our countries,” Lipman said. According to the World Nuclear Association (right), Mexico has two nuclear reactors generating almost 4% of its electricity. Its first commercial nuclear power reactor began operating in 1989. 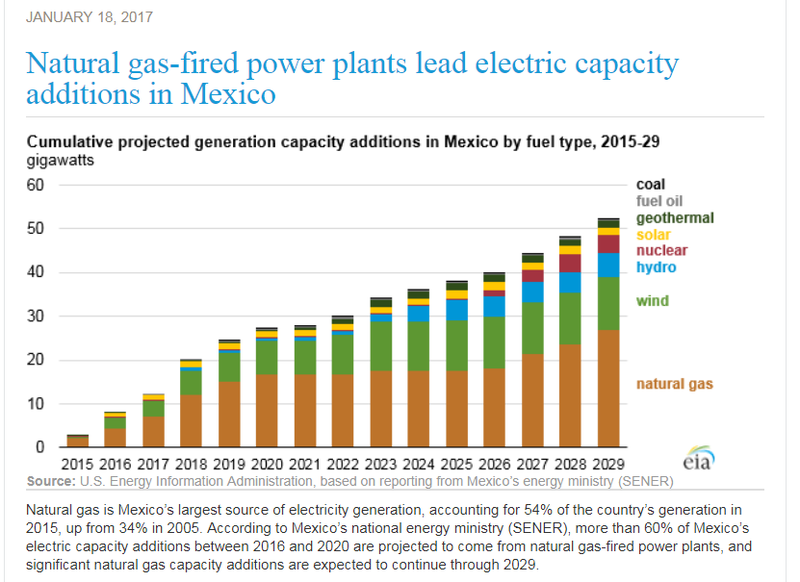 Under the the most aggressive for several energy development scenarios developed by the government as far back as 2010 up to ten nuclear power plants would be built at Laguna Verde so that nuclear energy supplied nearly a quarter of Mexico’s power needs by 2028. This plan would allow the country’s carbon emissions from power generation to remain virtually unchanged from 2008 despite projections of substantially higher demand. About 86% of Mexico’s electricity is currently generated by fossil fuels. Natural gas is the primary fuel for this purpose according to DOE/EIA. An earlier proposal was for one new nuclear unit to come on line by 2015 with seven more to follow it by 2025 to bring nuclear share of electricity up to 12%. Cost studies showed nuclear being competitive with gas at about US$ 4 cents/kWh in all scenarios considered. The assumptions for these energy policy scenarios have been challenged by continued low prices for natural gas which has resulted in a scaling back of the most optimistic plans. The most plausible outlook is for two-to-three nuclear reactors at Laguna Verde with completion by the end of the 2020 decade. According to the U.S. Department of Commerce, International Trade Administration, in a 2016 report, Mexico’s plans for full size new nuclear reactors focus on 1000 MW BWR type designs. It also assesses the market segments where U.S. firms would have the best opportunities to participate in these new builds. Financing of even two 1000 MW reactors at an “overnight price” of $5000/Kw would cost Mexico $10 billion plus the cost of upgrading the national grid to deliver the power to customers. Beyond that plan WNA also notes that Mexico may look to build more affordable small modular reactors to provide power and desalinate seawater for agricultural use. Because the desalinization plants need to be at coastal sites, and due to the cost of piping the water from them, it’s likely that Mexico would plan for multiple uses, e.g., industrial and residential uses of potable water in addition to use for intensive agriculture. Hydroponic greenhouse applications are often proposed for use with these plants since they use the water much more efficiently and avoid evaporation loss that would occur in open fields. For these reasons, locations for these plants would likely be near urbanized areas. The reactors would also benefit from being at coastal sites to use seawater for the condensation loop for steam coming out of the power turbines. Finally, it would make sense to build at an existing power station site to take advantage of rail, roads, and the available labor force. Expansion of cross border electrical power for California and other U.S. southwestern states has been discussed from time-to-time. Due to differences in the national grids, special equipment would be needed to move the power across the border in either direction. That said there are recurring discussions about tapping the Palo Verde power station in Arizona to send electricity to Mexico. Insofar as nuclear fuel is concerned, while Mexico has experimented with producing fuel from its own uranium deposits, at the current spot price for yellowcake, mining them would not be economically feasible. Postscript: The 123 agreement with Mexico was ready to go in summer 2016 under President Obama, but languished at the U.S. State Department during the tumultuous tenure of Sec Rex Tillerson who was so frustrated with the White House over being blindsided by Trump’s tweets that he once referred to the President as a “moron” and never explicitly denied saying so. Eight months later he resigned his post. The current Secretary of State Mike Pompeo praised the new 123 agreement and said in a visit to Arizona that it will provide new business opportunities for both countries. “The signing of the U.S.-Mexico Civil Nuclear Cooperation Agreement further expands our relationship, and will benefit the North American and U.S. suppliers in the nuclear energy industry,” Pompeo said. 2 Responses to Mexico Signs a 123 Agreement with U.S.
Mexico might need to diversify reactors type including PWRs and SMRs.